Rather than telling the Government how it can hack at public services to lower the deficit, why not take part in a real debate about how the economy could recover? 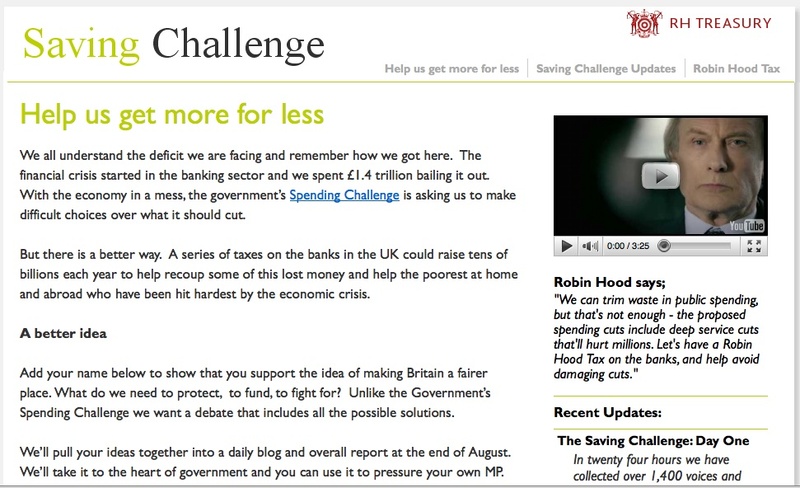 The people over at the Robin Hood Tax are running the Saving Challenge to do just that. A series of taxes on the banks in the UK could raise tens of billions each year to help recoup some of this lost money and help the poorest at home and abroad who have been hit hardest by the economic crisis. They’ll be turning your responses into a daily blog and then reporting back to us all at the end of July. LCID supports the Robin Hood Tax, and has since the campaign was launched. A small levy on financial transactions could raise such staggering amounts of money that it could save the lives of thousands. Have a look at their website and sign up to the Saving Challenge.